In summer, gardening requires plants with three key qualities: low maintenance (it's hot out there), heat and drought tolerance (ditto), and brilliant color—the brighter the better. Zinnias fit the bill on all three counts. And more. In fact, they're one of the best flowers that smart gardeners can put to work in their gardens. If there's an easier flower to grow, we'd like to know about it. Zinnias are annuals, meaning that they go from seed to flower to seed quickly. Zinnias' pointy seeds, shaped like little arrowheads, require only basic garden prep to sprout: sow them in well-drained soil, where there's full sun and lots of summer heat, and you'll have tiny seedlings in days, with flowers powering up in just a few weeks. No perennial can claim that speed! One gardening friend doesn't even bother to prepare her soil—she simply sprinkles seeds wherever she'd like a few zinnias, waters those spots for a couple of days, and lets zinnias' easy-to-grow nature take its course. Zinnias work wherever you need color. 'Pop Art'. 'Green Envy'. 'Persian Carpet'. 'Candy Cane'. With variety names like that, you know you're in for color. Zinnias come in a preposterous palette of every bright and pastel (except the blues), plus bi-colors, tri-colors, and crazy-quilt mixes designed for cutting, to attract pollinators, etc. Aside from fresh color, many new zinnia series offer height and width options, too. While the tall versions of Zinnia elegans remain the classic choice for the back of the border, shorter series now challenge the low ground once ceded to marigolds and petunias. The Magellan Series stay close to knee high at 14 inches, while the Thumbelina Series of dwarf zinnias peak at 6 to 8 inches. Zahara™ zinnias top out at just 8 to 12 inches—and are prized for their resistance to powdery mildew and leaf spot (see below). Zahara Yellow is short but sweet—we paired it with petite sunflowers in the entry beds at the Regenstein Fruit & Vegetable Garden. Zinnias work as cut flowers. Zinnias have style, in addition to long, strong stems, so they are naturally destined for the vase. Wonderful language gets used when describing zinnia flowers: stars and daisies, dahlias and spiders, buttons and domes, and quill-leaf cactus. Flowers can be "singles, " with petals lined up in a row around an open center, or semi-doubles, or doubles. All work marvelously in floral arrangements. Of course, the tall varieties are the zinnias of choice for cutting: 'Benary's Giant' is famous for its three-foot-tall, sturdy stems and large flowers. Cut zinnia stems at an angle just above a bud joint. Zinnias are typically long-lasting in a vase—strip the stems of all but the most visible leaves before setting them in water. Zinnias are low maintenance. Since they're fast-growing, they shade out weeds. 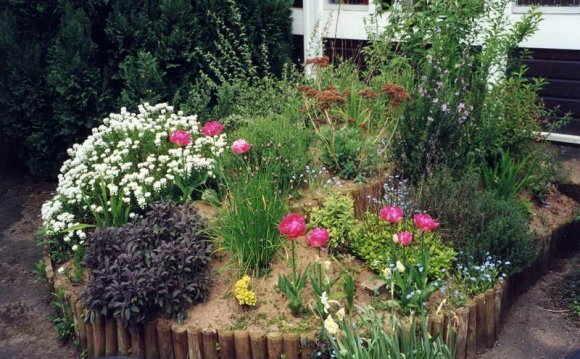 They don't require much in the way of fertilizing (just an occasional well-balanced mix), and they don't need mulching. Deadheading helps to produce more flowers. No time to deadhead? The Zaharas mentioned in the sidebard are self-cleaning—a real time saver when it comes to a large bed. Like Zaharas, the Profusion Series (hybrids between Z. elegans and Z. angustifolia) are resistant to the scourge of zinnias: powdery mildew. Water only when needed, and then only at the base of the plants. Wet leaves can promote mildew development, and splashing water can transfer fungus from the ground onto zinnia leaves in an instant. Camouflage tall, more mildew-prone varieties with other plants in the foreground. Do both #1 and #2 and live with the fact that zinnia leaves (but not flowers) are affected by wet weather—as one horticulturist put it, "Even when zinnias are covered in powdery mildew, they're covered in flowers." Zinnias work year after year.